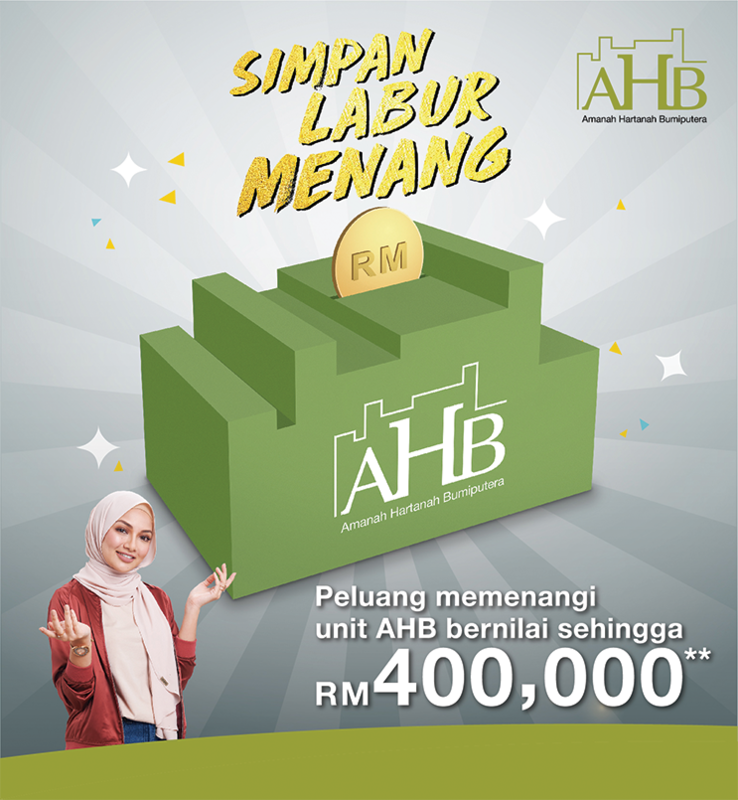 What is AHB Simpan, Labur dan Menang? 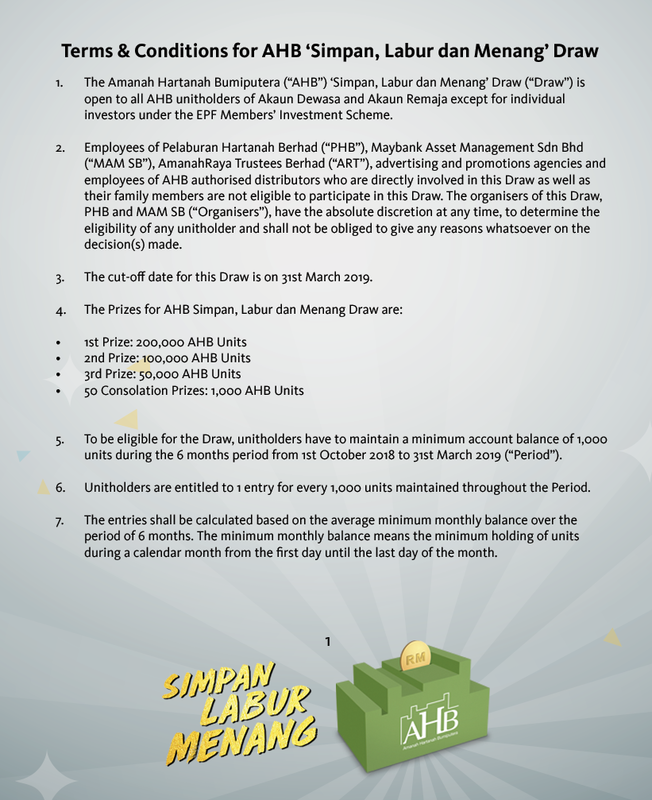 The Amanah Hartanah Bumiputera (AHB) Simpan, Labur dan Menang' Draw is open to all AHB unitholders of Akaun Dewasa and Akaun Remaja except for individual investors under the EPF Members' Investment Scheme. 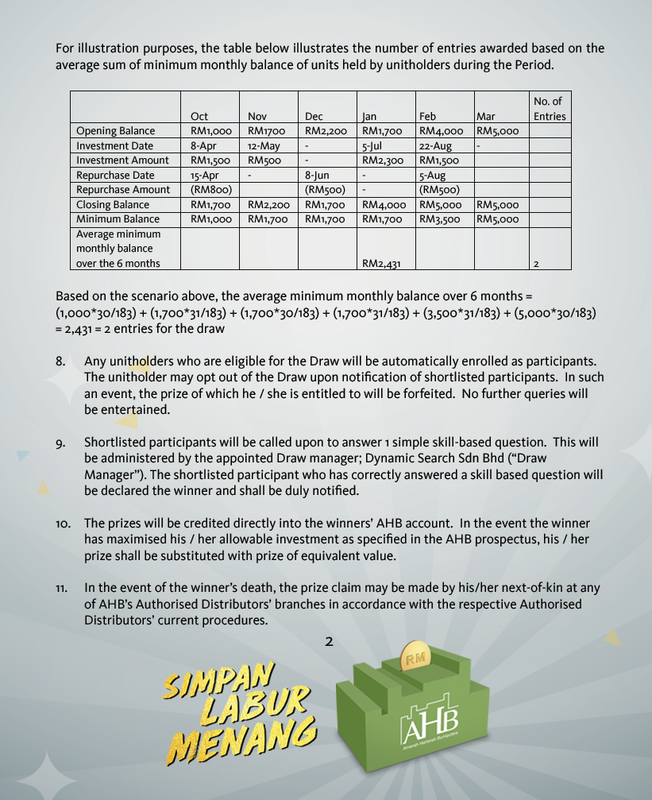 To be eligible for the Draw, unitholders have to maintain a minimum account balance of 1,000 units during the 6 months period from 1st October 2018 to 31st March 2019 ("Period"). Unitholders are entitled to 1 entry for every 1,000 units maintained throughout the Period. 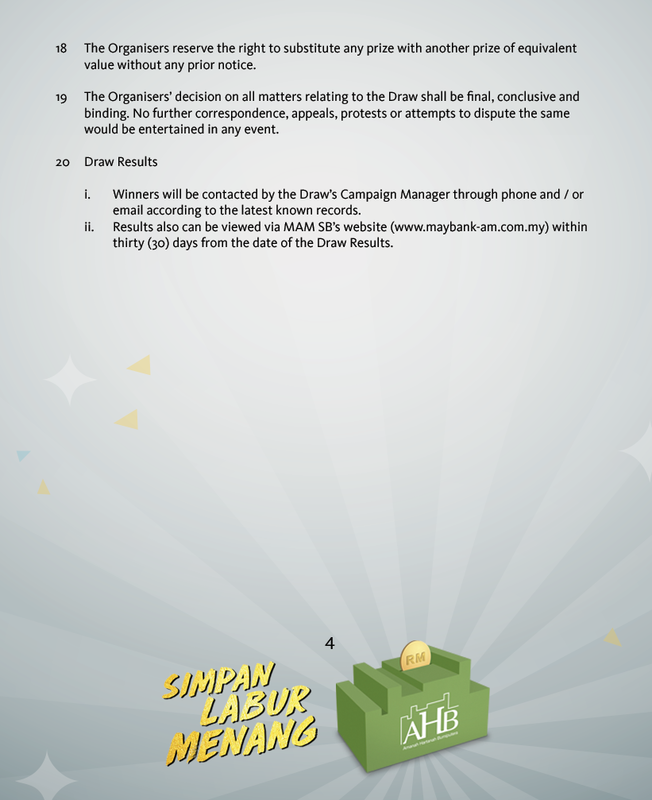 Click for the full Terms and Conditions and FAQ. Call 03-2297 7888 for more information or walk into any authorised distributors' branches nationwide to sign-up. 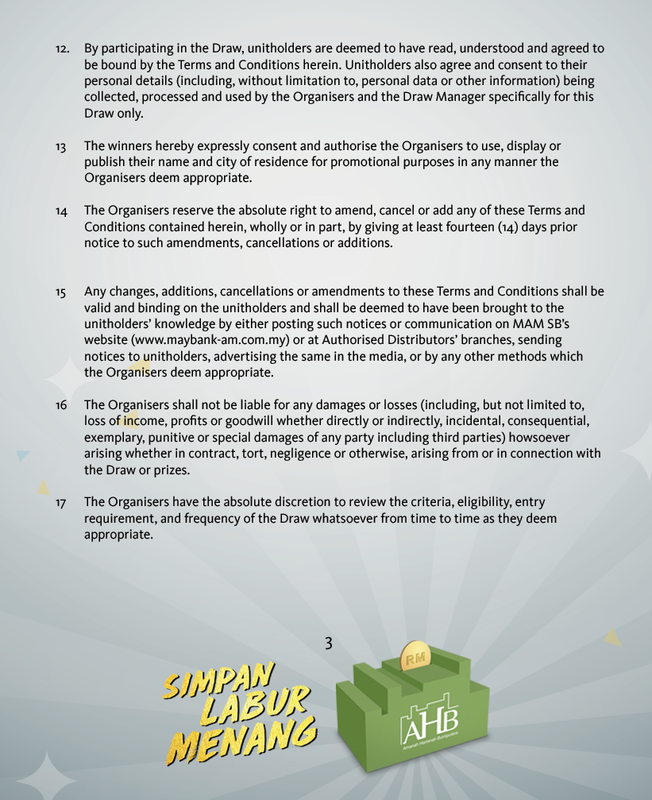 Investors are advised to read and understand the contents of Prospectus of Amanah Hartanah Bumiputera (“AHB”) dated 16 October 2016 (“the Prospectus”) together with the First Supplementary Prospectus dated 9 March 2017 and the Second Supplementary Prospectus dated 15 September 2017 (“the Supplementary Prospectus”) before investing. The Prospectus and the Supplementary Prospectus has been registered with the Securities Commission Malaysia, who takes no responsibility for its contents. A copy of the Prospectus and the Supplementary Prospectus can be obtained from any authorised AHB distributor. You should be aware that the investments in unit trust funds carry risks. You should also consider the fees and charges involved before investing. Income distributions, if any, may go down or up. Units, subject to availability, will be issued upon receipt of completed application form accompanying the Prospectus and subject to terms and conditions therein. *Subject to the terms and conditions of EPF Members’ Investment Scheme.